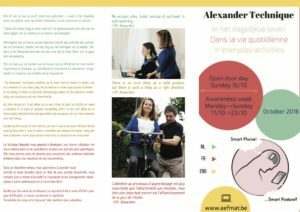 AEFMAT is happy to announce the International Alexander Technique Awareness Week from Sunday Oct. 16 to Sunday Oct. 23 2016. It will begin with our open day on Oct. 16 from 10:00 to 17:00 in central Brussels (at the Gemeenschapscentrum de Markten). Perhaps you have heard of the Technique, or maybe you are already familiar with it – either way, it will be our pleasure to introduce you to the Alexander Technique. Feel free to come along anytime between 10:00 and 17:00 on Oct. 16 to get some hands on work with one of our certified teachers. Introductory talks will also be held in English, Dutch and French. 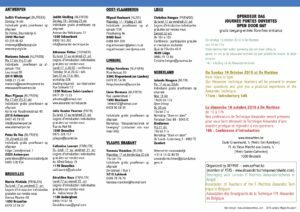 During the following week, other activities such as introductory lessons and workshops are being offered by teachers all around Belgium between Oct. 17 and Oct. 23. Please download the flyer for more information on all the activities during the awareness week.